Wonderful pictorial map illustrating the Beatles' early career in Liverpool. 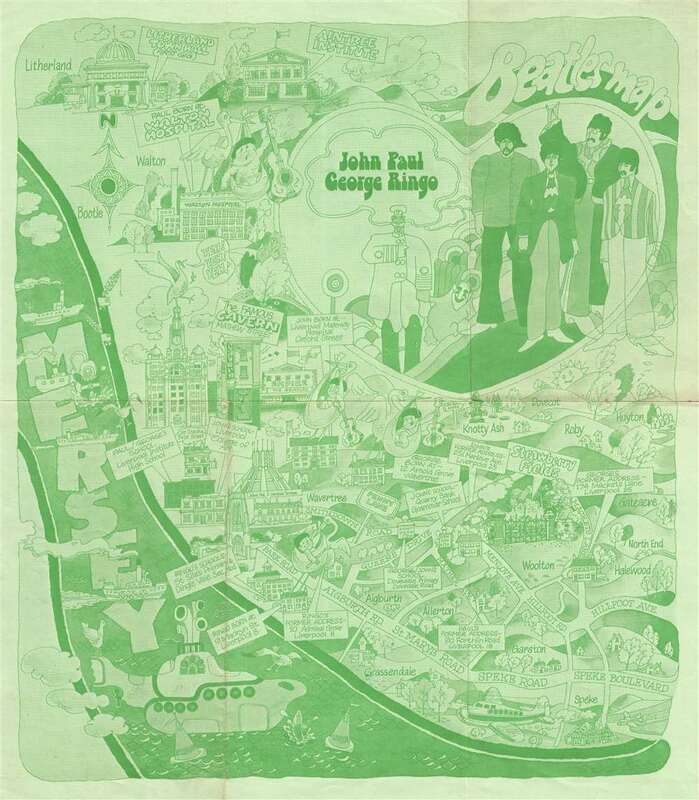 This is a 1974 Beatles map of Liverpool. Created in the style of The Beatles animated film Yellow Submarine, the Beatles pictorial map of Liverpool labels numerous places throughout the city significant in the lives of The Fab Four. Per the National Museums of Liverpool, this is 'one of the first Beatles maps of Liverpool that was ever produced.' It marks the locations where John, Paul, George, and Ringo were each born, the addresses where they lived, the schools they attended, and the locations of some of their first gigs. Streets throughout Liverpool are labeled, including signposts for Penny Lane and Strawberry Fields. John, Paul, George, and Ringo are illustrated just as they are on some Yellow Submarine posters on the upper right, along with two other characters from the film. The Yellow Submarine itself is depicted in the River Mersey, along with numerous other boats, fish, and seagulls. This map was published by The City of Liverpool Public Relations Office in 1974. Very good. Light wear along original fold lines. Light soiling. Blank on verso.